To read or download newsletters from prior years, click below to view a list of available newsletters. Join the NALC News electronic mailing list! Easter message from Bishop Bradosky. Nominations sought for positions to be elected at 2019 Convocation. Bishop, Executive Council and Court of Adjudication will be elected. NALC and East European Missions Network help build bridges in Ukraine. Lutheran Week 2019 is Aug. 5-9. Braaten-Benne Lectures to focus on work of Holy Spirit. North American Lutheran Seminary partners with Lutheran colleges to educate future NALC pastors. Polarization or Reconciliation? Part 2 – Compromise and Sacrifice – Ministry Matters from Pastor David Wendel. Youth and family ministry update. 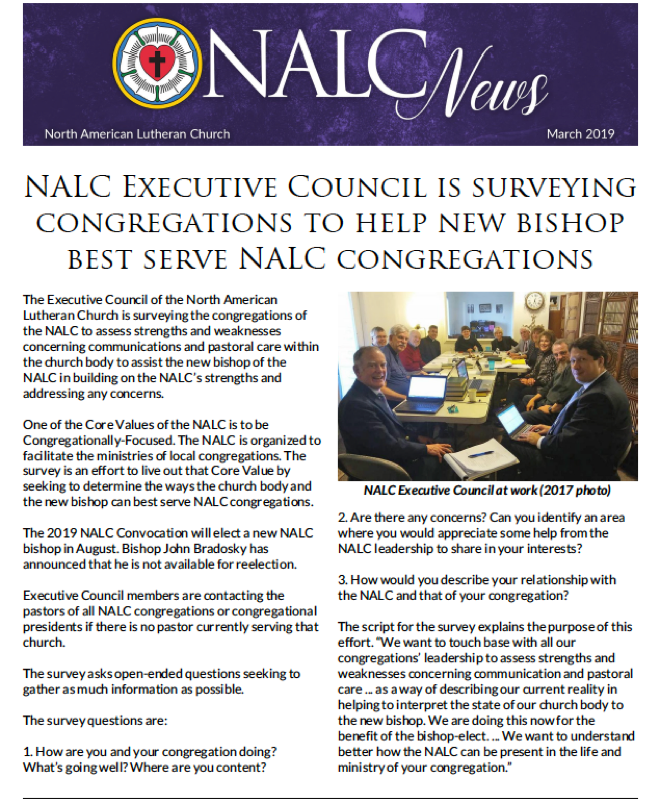 NALC Executive Council is survey congregations to help new bishop best serve NALC congregations. 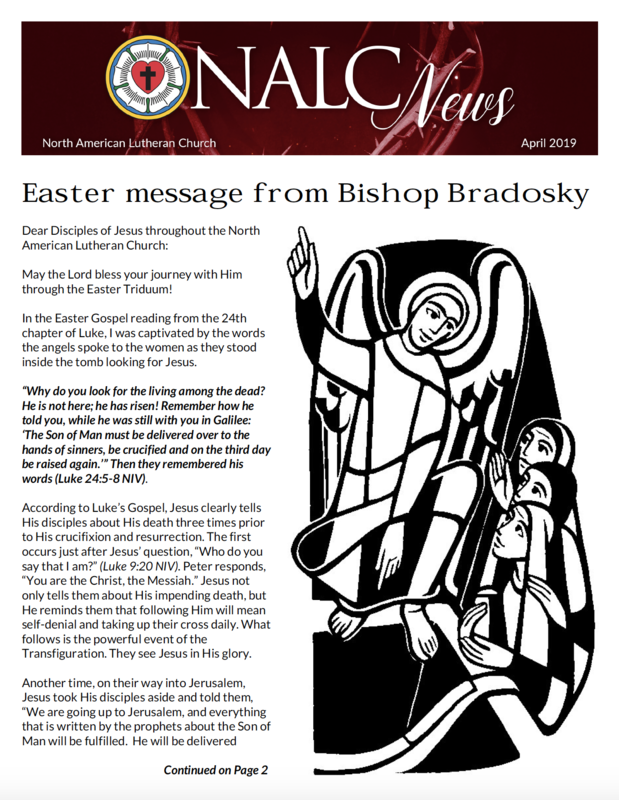 NALC Lenten Devotions for 2019. Canadian Rockies Theological Conference to focus on catechism as resource for life and witness. NALC Youth Gathering in Canada is May 17-20. Responding to persecution in Him – Message from Bishop Bradosky. NALC Disaster Response addressing flooding in Midwest. Lent is a time for equipping – Message from Pastor Brad Hales, Director of Domestic Mission. Belarus ministry update from Pastor Valery Hryhoryk. Mission in Uganda – Lutheran Lay Renewal. The Panzos in Mission – Democratic Republic of the Congo. Polarization or Reconciliation? – Ministry Matters from Pastor David Wendel. 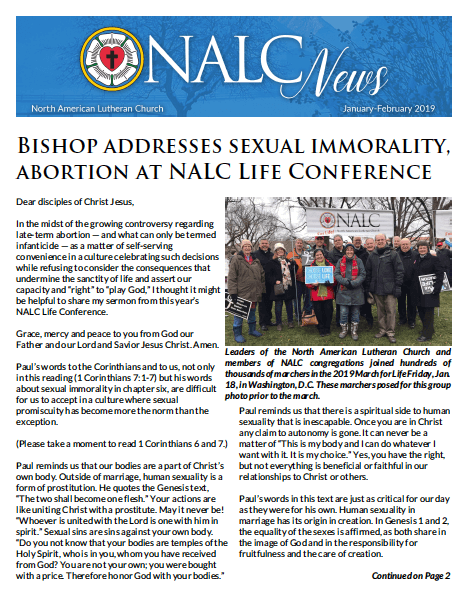 Bishop addresses sexual immorality, abortion at NALC Life Conference. NALC Life Conference in Virginia precedes annual March for Life. Speakers are announced for 2019 Braaten-Benne Lectures. Lutheran CORE to host “Rekindle Your First Love” event for pastors. Pondering Epiphany with Luther – Message from Bishop Bradosky. Update from Didi Panzo – NALC Global Worker in Democratic Republic of Congo. Resources from NALC mission office. Lutheran World Relief and IMA World Health combine operations. LWR projects for Lent and Palm Sunday. “The Word made flesh” – Ministry Matters from Pastor David Wendel. “Persistence in Prayer” by Pastor Gemechis Buba.